It’s a satisfying feeling after planning a trip three months in advance to wake to a perfect weather day for a scheduled event. 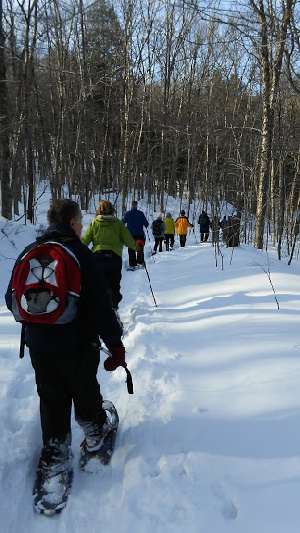 It was such a day for the snowshoe outing on the Stevenson Brook trail at Little River State Park in Waterbury. The single-file trail was well-packed and meandered over several bridges with views and sounds of the stream below. Our destination was the Old Sawmill site. Rusted metal pokes out of the snow, parts of old farm and mill machinery from the community that thrived here, where the land has grown back to forest. The question came up of whether these are historic artifacts or junk that should be removed. Slowly the forest takes back all signs of what was here more than a century ago.